In Latin America, Not Everyone Is Thrilled With The U.S.-Cuba Thaw : Parallels Cuba and Venezuela are close allies that often seemed to speak with a single voice when it came to bashing the U.S. But now they may be out of sync. 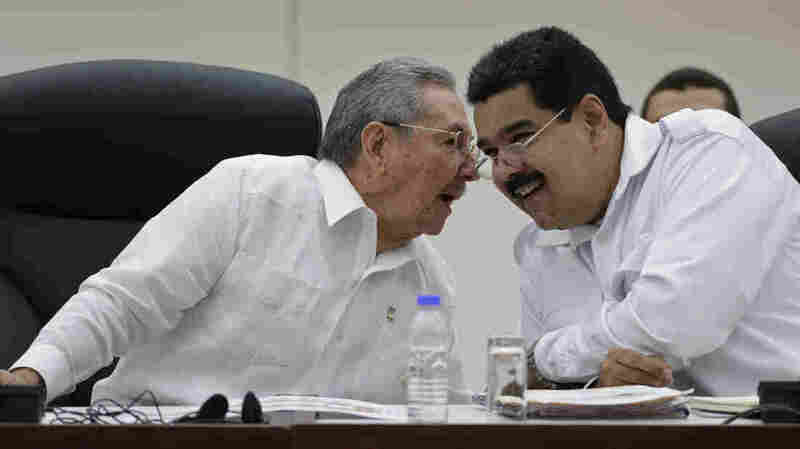 Cuban President Raul Castro (left) talks to his Venezuelan counterpart Nicolas Maduro at a summit in Havana on Oct. 20. The two countries are close allies that have been highly critical of the U.S. But with the U.S. and Cuba now planning closer ties, Cuba may tone down its anti-American rhetoric. Latin American governments have long viewed Cuba as the region's David facing off against the Goliath of the United States. So from Mexico to Argentina, leaders are endorsing Wednesday's announcement that the two nations intend to normalize relations. But this could prove awkward for Venezuela, which has been Cuba's closest ally and a fierce critic of Washington. In public, Venezuelan President Nicolas Maduro is praising the rapprochement between the U.S. and Cuba. "I am very happy," Maduro said in a speech Wednesday. "We must recognize this valiant and historically necessary gesture by President Barack Obama." But many analysts believe that, in private, Maduro is not so pleased. That's because Venezuela and Cuba have long acted in unison in opposing Washington while forging their own close ties. Maduro's predecessor, the socialist firebrand Hugo Chavez, greatly admired former Cuban President Fidel Castro. To help Cuba overcome its economic crisis following the collapse of the Soviet Union, Chavez began sending subsidized oil to the Castro government. Those shipments now make up 60 percent of Cuba's oil supply. In exchange, Cuba provides Venezuela with thousands of doctors and teachers as well as military advisers. Meanwhile, Venezuela has copied many elements of Cuba's authoritarian political model and has often gone even further in denouncing the United States as an imperialist bully. In an infamous 2006 speech at the U.N., Chavez called President George W. Bush "the devil." Although Washington and Caracas have never fully cut diplomatic relations, they expelled each other's ambassadors in 2010. Chavez died of cancer last year and Maduro has taken up his anti-American banner. Maduro led a march Monday through Caracas to denounce U.S. sanctions against Venezuelan officials for alleged human rights abuses. It's been a tough year all around for Maduro. He has faced massive anti-government protests and is now dealing with plummeting oil prices, high inflation and food shortages. But instead of examining his own policies, Maduro blames Washington for carrying out what he calls an "economic war" against Venezuela. Political analyst Rocío San Miguel says such rhetoric helps Maduro deflect criticism and unify his ruling Socialist Party. But she says Cuba's more pragmatic approach toward the United States could undercut Maduro's hard-line position. 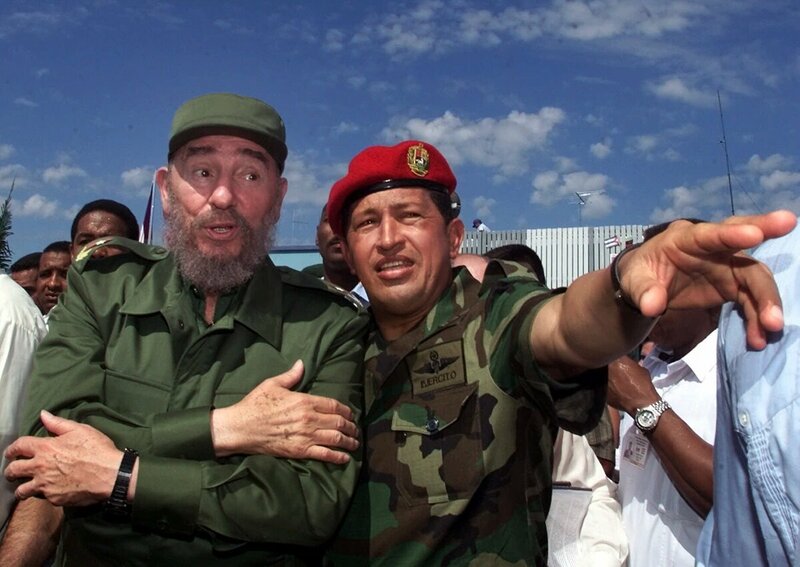 Cuban President Fidel Castro (left) and Venezuelan President Hugo Chavez in Barinas, Venezuela, in 2000. The two formed a close partnership, which has continued with their successors. However, the prospect of normal ties between the U.S. and Cuba may also have an impact on relations between Cuba and Venezuela. "For Caracas, this is a slap in the face from Havana because it exposes Maduro as radical and infantile, and for pursuing an ideological foreign policy," says Carlos Romero, a political science professor at the Central University of Venezuela. Harold Trinkunas, a Latin America analyst at the Brookings Institution, says that Cuba learned its lesson after becoming overly dependent on the Soviet Union during the Cold War. With Venezuela's economy now faltering, he says Cuba is trying to diversify by looking north. "Cuba is increasingly going to focus on that relationship with the United States or at least not want to damage progress on that by echoing what Venezuela is saying," he said. "On the rhetorical level, it's going to mean that Cuba and Venezuela are going to get out of sync." Over the years, Venezuela has followed Cuba's lead on a broad range of political and economic issues. But at least for now, warming up to the United States does not appear to be one of them.